Throughout my own career as a woman in leadership, and through many years as a coach and mentor, I’ve learnt that success isn’t just about destination. It’s about enjoying the journey along the way. I’m here to help you navigate your career and feel secure in your success, while still maintaining joy and ease in your life. Because, let’s be honest… Being a woman in leadership ISN’T always easy. The demands on your time are huge. The pressure to perform is intense. Then you have the masculine model of leadership to contend with. Not to mention what you’ve got going on outside of work. Sometimes it can feel like all too much. The doubt creeps in and you feel like you’re juggling a million balls, barely keeping them all in the air. If you’ve ever wondered if you can REALLY do this… If you’ve got what it takes to make a real impact as a professional woman… I’m here to tell you DO. You CAN have a fulfilling career AND a lifestyle you love. You just need the right tools, the right strategies, and the right people in your corner. That’s why I created this platform. With me as your mentor, you can achieve incredible things. By most people’s standards, you’re already successful – but I also know you want more. You’re a powerful action taker… a purposeful leader…. a woman with limitless untapped potential. My job is help you unleash that potential, leverage your skills, and guide you through times of uncertainty and growth. You don’t need to DO more to BE more. It’s about working smarter, not harder – and I’m here to show you how. Together, we WILL create a career that fills your heart and soul to the brim – where you feel valued, energised and remarkably effective, while also enjoying good health and happiness. Whether you’ve got your sights set on a certain role, you’re looking for a complete career change, you need help mapping out your next move, or you’re ready to take your leadership career to a whole new level, I can help you reach the destination AND enjoy the journey. Ready to make a bigger impact? We need to talk. Click HERE to book your FREE Clarity Session. In this 1:1 call, we’ll look at where you’re at, where you want to go, and how we’re going to get you there. There’s no cost, no obligation and absolutely no pressure. It’s all about seeing if we connect. So, how did I come to be a women’s leadership coach? The journey wasn’t all smooth sailing. After finishing Uni, my career hummed along nicely for the first 15 years or so. I was enjoying regular promotions, pay rises and new opportunities. I loved my work and I was being recognized for my leadership skills and strong results. In terms of my lifestyle I was living the dream. I was earning good money, which meant I could indulge in holidays and extended adventures overseas. Plus, my corporate role in Health and Safety included regular interstate travel, which for my Dad, was proof I had made it! As a single woman without children, my work was so important. I was fiercely independent, I had a mortgage to pay, and I wanted to make a real difference. Everything was going according to plan… but then the wheels fell off. It all started with a corporate restructure. My role changed, and I found myself working in a position that just didn’t fit me. I was a square peg in a round hole. I had leaders who I admired, who encouraged me to take on different roles with more responsibility, but the restructure really took its toll. I lost my mojo, my sense of direction and all belief in my skills. My confidence was in tatters – and my heart would sink every time I walked through the office doors. To make things worse, my health fell apart. It was then that I made the difficult decision to put my health first and walk away from my corporate career. Making that move was so scary. Saying goodbye to a great salary and job security took courage, but I knew I needed to make a change. The pain of continuing down the same path, compromising my health and my sanity, was greater than my fear of the unknown. The first thing I did was find a coach. Someone who I trusted to guide me through this huge transition. I didn’t want to just survive, I wanted to thrive… and I knew I couldn’t do it alone. I invested my savings into self-development and threw myself into learning about human behaviour and the importance of empowered feminine leadership. I was fascinated by the amazing world of neuroscience, and I buried myself in every book and course I could find. I learnt the secret code for controlling the inner critic and boosting confidence. I discovered simple language structures for becoming an influential communicator, and recognising behaviours that get in the way of success. I applied everything I learnt to myself and everything changed. I invested in MYSELF and it paid off. I was happier, healthier and more fulfilled than I had been in years. I found more confidence, more clarity and more direction than ever before. I loved the person I was becoming – and, for the first time ever, I believed with absolute certainty that I could achieve anything I wanted. Fast forward to today… and not only am I reaching all my goals, I’m helping other women to do the same. Through my popular workshop, Career by Design, and exclusive community, The Leadership Connection, I’ve helped hundreds of women create the career and lifestyle of their dreams. 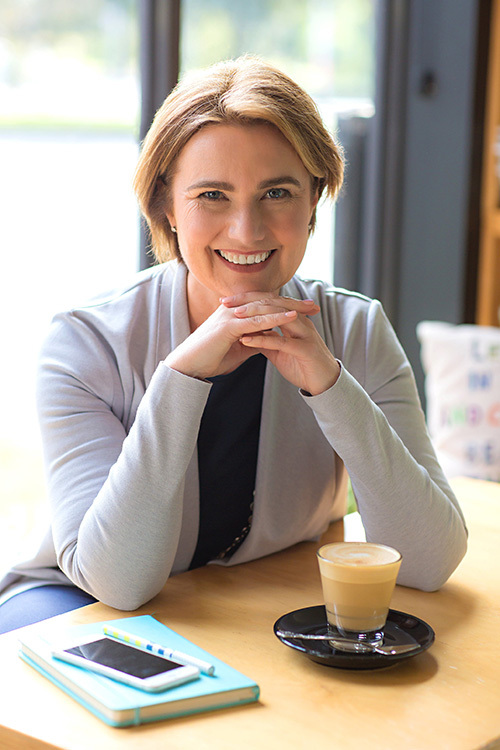 Plus, through my work with some of Australia’s top-tier companies, I’m helping big businesses to build cohesive work cultures, improve team dynamics, and boost the results on their bottom line – all while empowering their women leaders. Women bring connection, collaboration and a unique consciousness that is desperately needed to bring balance and harmony to the corporate workplace. And yes… the research shows we get RESULTS. I want to see more women like YOU sitting confidently at the leadership table. If you’ve already got a seat, I’m here to help you OWN it – and have a lasting impact. No matter where you’re at in your career, there is a pathway or program that’s perfect for you. Will get you there sooner. Unsure which option is for you? Book a free Career Clarity Session with me on the phone. I’ve worked extensively as a women’s leadership coach, corporate trainer and career strategist since starting my business in 2011. With over 15 years’ experience working in corporate leadership, plus 7 years working directly with corporate leadership teams, I understand the unique skills women bring to the decision-making table. I believe all businesses benefit from strong, female leadership, and I’m passionate about bridging the gender gap in corporate leadership. and I’ve dedicated my career to doing just that. My corporate experience is complemented by qualifications in behaviour profiling, executive coaching and neuroscience, giving me a unique perspective on career success, and the mindset required to reach the top. My approach is fresh, warm and energetic, and I believe in making every coaching experience fun and transformational. I work with you to get the results you deserve – and I’ll be there to celebrate with a glass of bubbles when you reach your goals. I’ve worked with some of the biggest names and brightest minds in Australian business, and helped hundreds of women create incredible careers. I love helping driven women unlock their limitless potential both personally & professionally and I’ve dedicated my career to doing just that. If you’re a mid-career professional woman who’s ready to make your next big move, check out my Programs for Individuals. If you’re a business who wants to harness the power of your women leaders, learn more about my Corporate Programs.